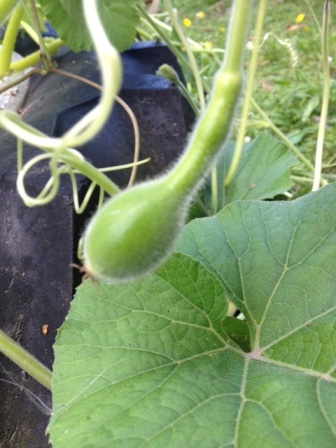 Summer warmth and rain will be producing rampant growth on the gourd vines all around the region. 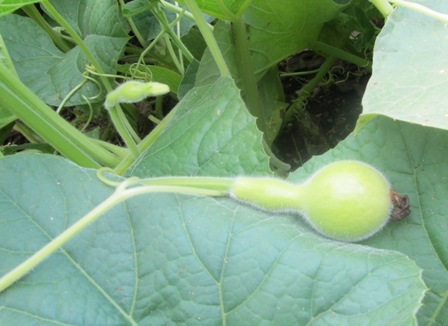 Gourd growers will be noticing the growth of the fruit from below all the female flowers. The male flowers produce pollen, but no fruit. So, if you seem to have lots and lots of flowers but not many young gourds forming, it means you have mainly male flowers. You can intervene in nature to change the size of your gourds and the numbers of fruit that form. If you want your fruit to grow large, cut off the end of the vine-branch that lies beyond your young gourd fruit, so that the all the growth goes into the one fruit, instead of into forming more stems, leaves and extra fruit. 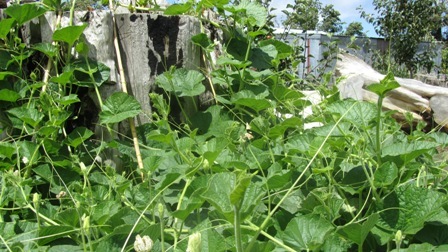 If you want lots and lots of gourds, chop the end off the long vine, so that it grows more side branches. These are called laterals, and they produce the fruit. Whanganui weather this summer has been very variable, with lots of wind and rain as well as sunshine. Hopefully all the gourd-project plants out there have been growing rampantly in the summer warmth, sending out long tendrils and finding strong supports to grow up. If we get a dry spell, the plants will need watering. Keep an eye out for wilted leaves. If they droop, give each plant about one bucket of water.